Kristin Thelander has been active in the IHS in many capacities, with a major effort and lasting legacy as coordinator of the Thesis Lending Library. 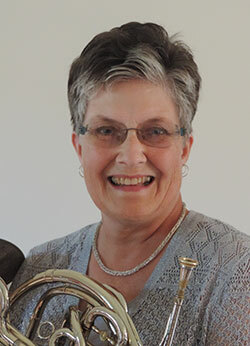 She has performed on both modern and natural horn at many International Horn Workshops and has been a guest artist at many regional horn workshops. She was particularly known for her natural horn performances and master classes. Kristin received a BM from St. Olaf College, where she studied with Miles Johnson; an MA in musicology from the University of Minnesota; and a DMA from the University of Wisconsin, where she studied with Douglas Hill. She won First Prize at the American Horn Competition in 1981. She was on the music faculty at the University of New Mexico, and then joined the University of Iowa, where she was horn professor (1989-2000), Director of the School of Music (2000-2009), and Director of Planning until her retirement in 2016. Kristin has been a member of the Madison (WI) Symphony, the New Mexico Brass Quintet, the New Mexico Symphony, the Santa Fe Symphony, the Iowa Brass Quintet, the Iowa Woodwind Quintet, the Bon Vivant Horn Quartet, and the La Crosse (WI) Symphony. Highlights of her career include international tours to the People's Republic of China, South Korea, Germany, Italy, Mexico, and Brazil. Kristin has recorded with the New Mexico Brass Quintet (Crystal Records), the Iowa Brass Quintet (Americana: A University of Iowa Celebration), and the University of Iowa Center for New Music; Music of the Early 19th Century for Natural Horn and Fortepiano (Crystal Records); Crosswinds: Music of Margaret Brouwer (CRI); Thoughtful Wanderings: Music of Douglas Hill (UW); and Francis Poulenc: Complete Music for Winds and Piano (MSR). Kristin served on the IHS Advisory Council (1987-1994), as Secretary-Treasurer (1990-1992), and as Vice President (1992-1994), Commissioning Assistance Program chair (1989-1994), member of the Board of Referees for The Horn Call (1989-1997), Coordinator of the Thesis Lending Library (1994-2016), and an adjudicator for many IHS solo and orchestral horn competitions. She has written several articles for The Horn Call and The Horn Call Annual. She was awarded the Service Medal of Honor in 2016.